Bringing together our passion for motorcycles and our purpose of road safety, HB`s Advanced Rider Training Academy was established in July 2013 with the aim to improve safety and competency of motorcycle riders on the South African roads by providing professional motorcycle training. We are based in the Helderberg Region of the Western Cape serving Cape Town, Bellville, Stellenbosch, Somerset West, Strand, Gordons Bay, Kleinmond, Hermanus and the Overberg Region. Gaining your Advanced Road Rider Certificate is not only exciting but also potentially life-saving. New and experienced riders can benefit from the training with specialized training customized to your experience level. HB’s Advanced Rider Training Academy specializes in advanced “road reading” techniques in real-world environments. At HB`s Advanced Rider Training Academy we help you become Confident, Competent and Safe through the teaching of proper motorcycle control that create good and correct riding habits for LIFE. Learning about the consequences of road safety first hand, Hendrik Bosman, founder of HB’s Advanced Rider Training Academy, was in a motorcycle accident in December 2005. He learnt that learning advanced techniques from the internet could have near fatal or even fatal consequences. Subsequently, he read just about every available book on safe riding techniques, gained training with the BMW Motorrad Rider Academy in Johannesburg, followed by an intensive Advanced Rider Training regime in both USA (Ride Like A Pro) and the UK (IAM & ROSPA). 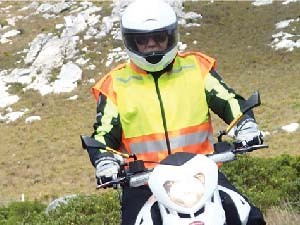 In 2014 Hendrik undertook further Advanced Alpine Road Training with GSSS, the ONLY Italian Road Training Academy Accredited and recognized by the Italian Government. He also attended the Ducati Rider Experience Basic Training at the World Ducati Week. During June 2015 Hendrik attended the DRE Courses from Ducati at the Mugello Race Circuit to further become uniquely qualified in all aspects of road & street riding techniques. The outcome is a specialized and uniquely qualified Internationally Accredited Advanced Road Riding Instructor, who holds the highest qualification an instructor can attain in the World, endorsed by the UK Government’s Driving Standards Agency. He is one of the original founders of THINK BIKE. 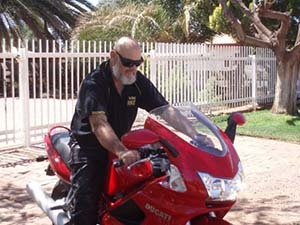 Trained and assessed by the ONLY multiple qualified and experienced road rider instructor in South Africa. Advanced Rider Candidates must provide their own gear. A friendly and relaxed environment. View available course dates then click on the Course and Date to see the relevant details pertaining to the course. All and all, anyone with any size motorcycle is welcome, so get ready for a once-in-a-lifetime-experience.